Steve Smith eclipsed a Don Bradman record as Australia chased victory over India in the fourth Test in Sydney. The captain hit 71 off 70 balls to pass Bradman’s 1947-48 Australian record of 715 for most runs in a series against India. Smith, who had already made four centuries in the series, scored 769 runs at an average of 128.16. Australia raced to 251-6 and a lead of 348 over India before rain stopped play at the end of day four. Looking to wrap up the four-match series 3-0, the hosts dismissed India for 475 shortly before tea to take a 97-run lead after the first innings. India captain Virat Kohli was only able to add seven runs to his overnight score before clipping a Ryan Harris delivery to Rogers at midwicket. Kohli’s 147 helped bring his tally over the four tests to 646 runs, the second highest by an Indian batsman in an overseas series after the 774 Sunil Gavaskar accumulated in West Indies in 1971. In response, Australia opener Chris Rogers hit a 77-ball 56 before he was caught at midwicket off Bhuvaneshwar Kumar, while Smith was eventually out lbw to Mohammed Shami. Joe Burns weighed in with three sixes and eight fours in his 39-ball 66. Bradman, who died in 2001 aged 92, is regarded as Australia’s finest cricketer and the greatest Test batsman of all time. 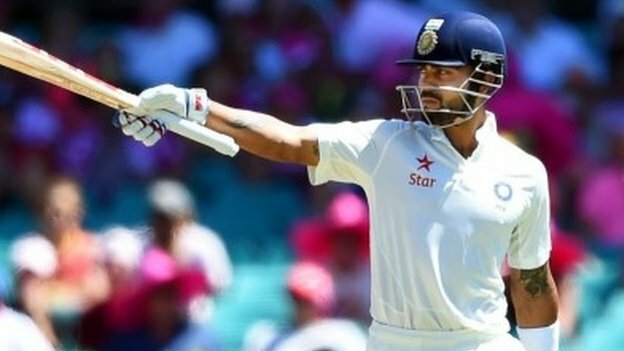 Virat Kohli became the first man to make three Test centuries in his first three innings as captain on an eventful third day of the fourth Test against Australia in Sydney. He made an unbeaten 140, while Lokesh Rahul, with 110, helped India finish on 342-5, in response to 572-7 declared. Rahul was dropped on 46 by captain Steve Smith, who blamed television device ‘spidercam’ for the error. Smith was “distracted by one of the wires in his eyeline”, said Australia. Spidercam is a camera system which gives viewers a bird’s eye view of the action using cables to carry a camera on wires above the action. Australia have already secured the series after winning the first two Tests in Adelaide and Brisbane and drawing the third in Melbourne. Australia captain Steve Smith scored his fourth century in successive Tests to put his side in control of the fourth Test against India in Sydney. 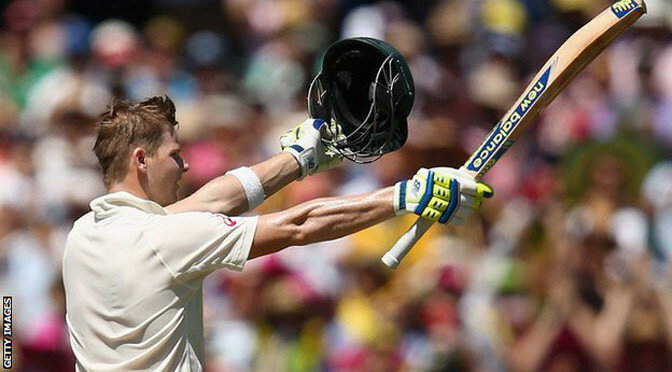 Smith’s 117 saw him match Sir Donald Bradman and Jacques Kallis’s record of four hundreds in a series. The stand-in captain shared a 196-run partnership with Shane Watson (81) for the third wicket as Australia declared their first innings on 572-7. India recovered from the early loss of Murali Vijay to close day two on 71-1. Shaun Marsh (73) and Joe Burns (58) also scored half-centuries as all of Australia’s top six batsmen passed 50. Opener David Warner scored a century on the first day. 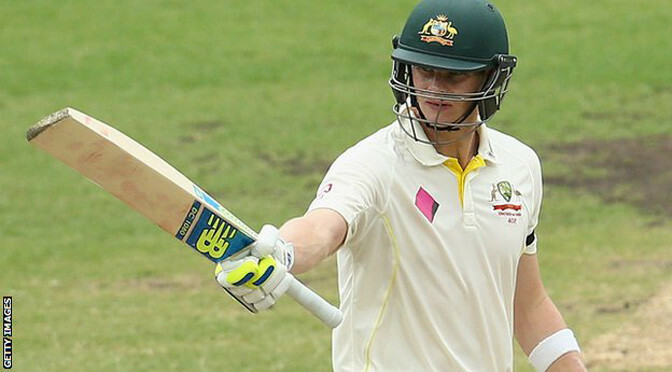 Smith has scored 698 runs at an average of 139.60 in seven innings in the series. Batsman David Warner scored a century and paid tribute to Phillip Hughes as Australia dominated day one of the fourth Test against India in Sydney. 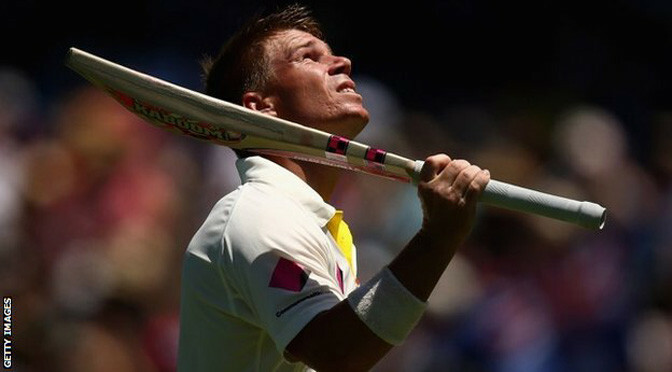 Warner hit 101 and on reaching 63, he took off his helmet and kissed the ground near the spot where Hughes was fatally injured, when on 63 runs. He shared an opening stand of 200 with Chris Rogers (95) in Australia’s 348-2. It was Warner’s 12th Test century and third of the series with the 28-year-old needing just 108 balls to reach the milestone. “It’s very special,” added Warner. “I haven’t scored a hundred at home or the MCG and I was sort of talking myself out of it. The opening partnership was ended when Warner was caught in the gully by Murali Vijay off the bowling of Ravichandran Ashwin. In the next over Rogers chopped a Mohammed Shami delivery onto his stumps to depart five runs short of his hundred, but stand-in captain Steve Smith (82 not out) and Shane Watson (61 not out) guided Australia to 348-2 at the close. Australia hold an unassailable 2-0 lead in the four-match series, with emotions in the final match heightened because it is taking place at the same ground where Hughes, 25, died last year. 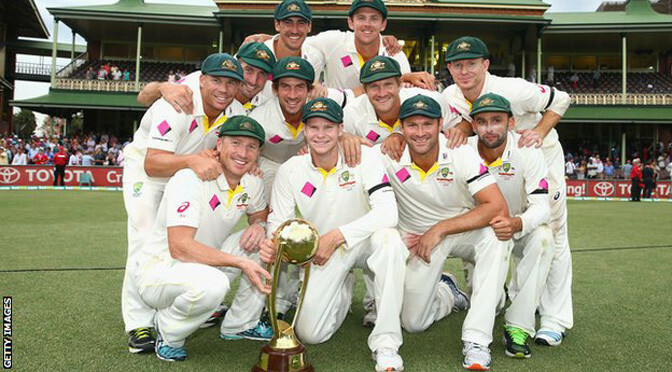 Cricket Australia unveiled a memorial plaque outside the home side’s dressing room on Monday.